You do not want to live with rats or rodents in your home. Maybe you have thought about using an exterminator rat service in Las Vegas. Perhaps you are uncertain about what type of rodents you can find around the home or not sure if you need to call in a professional. We have the answers right here for you. No matter what concerns you have the rodent causes devastation and carries diseases. The first rodent is the Norway rat and is very destructive. The pest can weigh up to one pound and compare to other rats very long. The love garbage and live in cluttered areas and known as scavengers. They might not be a big problem in the area but spotted around town. They breed quickly, and once you see them, you need to take action. The second pest is the Roof Rat and has been around since 1990. Many believe they made their way into the city with the imported palm trees. They are smaller than the Norway rat but remain destructive. They eat natural foods and love to scavenge the kitchen for fruit and vegetables. They also dig around garbage when their food scares. The rodent is a big problem as each female can carry up to eight babies and to make it even worse they can have up to 6 litters a year. Last on the list is the field mouse that is small and brown in color. They are omnivores and eat meat or anything they find that is safe to eat for them. They burrow the same as the roof rat and have up to 14 babies with each litter they have. You need to stop them as they can reproduce in 8-weeks. 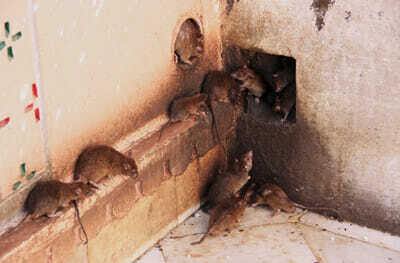 Having an infestation of rats or mice in the home is dangerous as they create health hazards. They left droppings and urine everywhere and associated with the Plague, Salmonella, Allergies, Asthma, Typhus, Rat Bite Fever, Flea Infestation, Bacterial Infections, and more. The most significant thing that attracts them is food in the home. Rats usually look for a place where they have food available when breeding. They prefer cluttered areas that are unclean as it provides them loads of space to hide. The rodent you can find indoors and outdoors so best to keep an eye out for them. Always keep the outside of the home clutter-free and clean. Remove excess weeds around the fence area and clean up debris and leaves outside. Do you keep firewood stored, make sure to lift it up from the ground? Keep trash stored securely in a sealed trash can. Keep trash cans away from the house and look for cracks in the foundation of roof vents. Fill up gaps with steel wool and ensure that the dryer vent has a mesh screen to block the entrance to the house. If you have trap doors for your pets keep them secure at night. Is it time to call the exterminator? If you have noticed any droppings around or in the home, saw chewed wires, or heard scratching and gnawing sounds at night – it is time to call in a professional, and they will take care of the infestation in your home. You might have considered using over the counter methods, but the truth is if you have a rodent infestation, it will not help. The problem is these rodents breed fast and sighting one means there are hundreds more. With the help of a pest control service, they can help you stop the infestation and allow you to get control over your home again.